Competition flair consists of highly choreographed show stopping routines. A great competition flair performance requires a ton of preparation. The routine is rehearsed countless times in the backyard. People came to see a flair competition, so it better be practiced & polished! Bottles are numbered, taped, and filled with the minimum needed to make your designated drinks that competition requires. 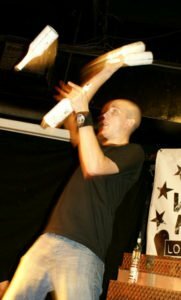 In flair competitions, you are really not interacting with individuals, but the audience as a whole. After an amazing sequence, you pause & look up, people applaud, but the interaction is much different than it would be with 3 or 4 customers you are serving at your bar. You also have a lot of freedom when you are on stage doing a competition. Freedom to take 3 minutes to make 1 drink. Freedom to shut out the audience and focus if you choose. Even freedom to spill a little. Your not really supposed to spill, even in competition, but it happens, a lot, and in competition, its overlooked, no big deal. Competitors compete for cash prizes, bragging rights, clips to put on youtube & hopefully leverage into a better bartending job, making bigger money. 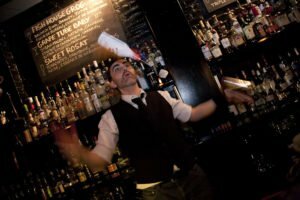 The foundation for being a great competitive bartender is to master the art of working flair. Check out the video at the bottom of this page for one of the best competition style routines we have ever seen. The best flair bartender, Alexander, from Russia on Ukraine’s Got Talent. 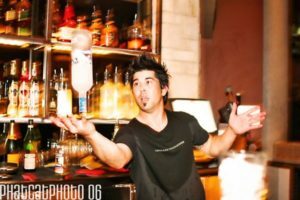 A great working flair bartender is mixing basic tricks in evenly throughout the night, not slowing down to make a drink & interacting with the customer. Customers aren’t usually expecting flair moves, so it doesn’t take a lot to impress. A quick toss of the glass behind your back, and then end with tossing the lime up from behind your back & catch in the drink wont slow you down, and will be enough to have people walking away thinking; what a great bartender, I’m going to make sure to go back to him later on for sure. When customers are impressed & happy, tips usually go up, which makes the bartender happy. Working Flair wouldn’t get you very far on Americas Got Talent. Working flair is all about interaction with that guest, in that moment. Mixing tricks in throughout the night, so your always entertaining to watch. When you are doing working flair, people are always watching. Customers who might not have come over at all make their way to check out what’s happening. Your tips and sales go up! Maybe a manager from a different bar watches you from across the room, observes how you make the guests happy, and your station is busier than most throughout the night, and all of a sudden you have a job offer at a better bar across town. Your manager is also watching, even when you don’t realize it. If you slow drink sales, they might feel your flair is costing the bar sales and tell you to stop. You spill alcohol while your flipping at work? Expect your manager to ask you to stop. If you do it again, he might ban you from doing flair entirely. If this happens, all the hard work you put into practicing, all the extra money you could have made in tips, all the opportunities that could have come when your being exceptional & standing out from the crowd – gone. So be aware of how long people are waiting for drinks, and reduce, or increase the number of tricks you are mixing in to keep the line moving & sales up. And never do a trick you cant pull off without spilling. Alcohol spillage is never acceptable. At our one day flair seminars, we focus on working flair, and helping you build a good foundation of basic moves you can use to increase your tips right away. If you become passionate about flair, and want to compete, you will be starting with a great foundation of basics. You can then add bigger and better skills on top of that base. Working flair is the foundation to competition flair.